Enterprises use data virtualization software such as TIBCO® Data Virtualization to reduce data bottlenecks so more insights can be delivered for better business outcomes. 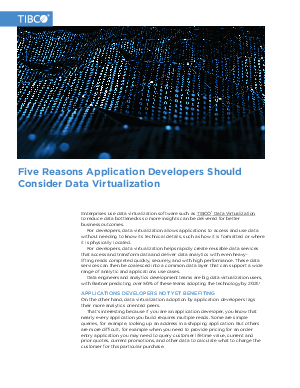 For developers, data virtualization allows applications to access and use data without needing to know its technical details, such as how it is formatted or where it is physically located. For developers, data virtualization helps rapidly create reusable data services that access and transform data and deliver data analytics with even heavylifting reads completed quickly, securely, and with high performance. These data services can then be coalesced into a common data layer that can support a wide range of analytic and applications use cases. Data engineers and analytics development teams are big data virtualization users, with Gartner predicting over 50% of these teams adopting the technology by 2021.